I have this one on my deck under table and chairs. Looks great a couple of years later. Washes great also, when it gets dirty, actually looks brand new. Safavieh Poolside Gray/Cream Indoor/Outdoor Polypropylene Rug - 6'7" x 9'6"
Safavieh Courtyard Majesty Natural/ Brown Indoor/ Outdoor Rug Set - 6'6" x 9'6"
Safavieh's Courtyard Collection creates a dynamic presence with its fashionable and transitional designs that are suited for both indoor and outdoor settings. These rugs have been expertly power loomed of enhanced polypropylene to create intricate motifs and ensure a comfortable surface underfoot. For outdoor use, this rug will turn your deck, poolside, or patio into a resort-style entertaining space. 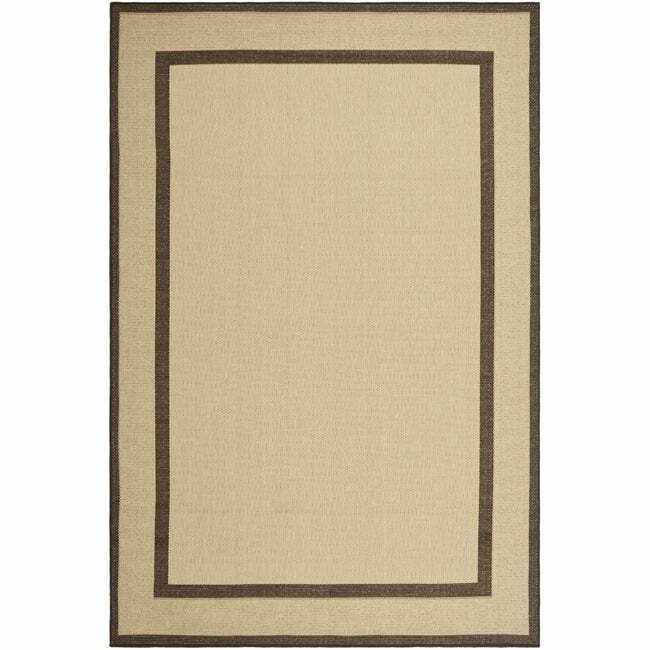 Featuring a main accent color of natural, this rug is in vogue with its tasteful and bold modern design. 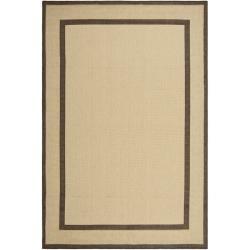 There is beauty in simplicity, and this rug defined chocolate border with its solid natural weave makes for a sleek addition to your home furnishings. Dimensions 6 ft. 6 in.x 9 ft. 6 in. & 1 ft. 8 in.x 2 ft. 8 in. I love these rugs! I saw them online at a different retailer for a lot more money so I"m happy I found them here! They look great out on my deck/patio and I have two chaise lounges and a table on the rug. It's a great size, not too big and not too small. I have the small rug on my deck leading into my living room. I would recommend these rugs to everyone! This rug is not very substantial and I wouldn't recommend purchasing it for anything other than protecting the surface beneath it. I had hoped to use this under the table on the patio, but it is so flimsy it wants to fly away whenever there's a stiff breeze outside. I ended up putting it in the basement in the laundry room where it is, admittedly, at home. Avoid if you're looking for a nice rug for entertaining or dining. Perfect color for a busy kitchen. The one thing I like about this rug is you can wash it with spraying water outside when there is a tough stain, and hung to dry. I place my rug in my busy kitchen..the dirt is not very obvious to see. Easy to clean with dump cloth when you a drop of dark stain. Can be place indoor or outdoor. Very thin, loose weave rug. Less quality than I have come to expect from overstock.com. I was looking for a simple rug under my kitchen table to protect my wood floor in case of spills. This weave is so thin it wouldn't absorb much. The color is definitely not beige, more of a tan-light brown. The edges are very nicely bound. Mine arrived ripped, and had to be returned anyway (the return process was not as easy as I expected!) Because of the tight loop weave any tears or pulls are very noticeable. I believe you get what you pay for, but I come to overstock.com because I usually get more for my money here; not in this case. Great for the outdoor patio or deck. Description is exactly what the product is. The wind does blow the rug around a little but its not an issue. Looks great on my deck. Much of what I expected. Good rug for use in the outdoor sunroom. Rug was just okay. Thin and flimsy but it was priced low. "Could you please tell me if this is 2 rugs or 1 rug? I need the 6'6 x 9'6, and what is that price?" This is a set of two rugs. 6'6 x 9'6 and 1'8 x 2'8. "hi there - does this rug have any backing on it -perhaps latex or something? i'm looking for a rug that won't allow oil to seep through." The backing and the entire rug is made with 100-percent polypropylene. Safavieh Madison Gemma Moroccan Boho Ivory / Navy Rug - 5'-1" X 7'-6"
Safavieh Courtyard Border Natural/ Chocolate Indoor/ Outdoor Rug - 6'6" x 9'6"